Last week during the 50th year commemoration of “Blood Sunday” in Selma, Alabama, this article was circulating around the Asian American blogosphere. 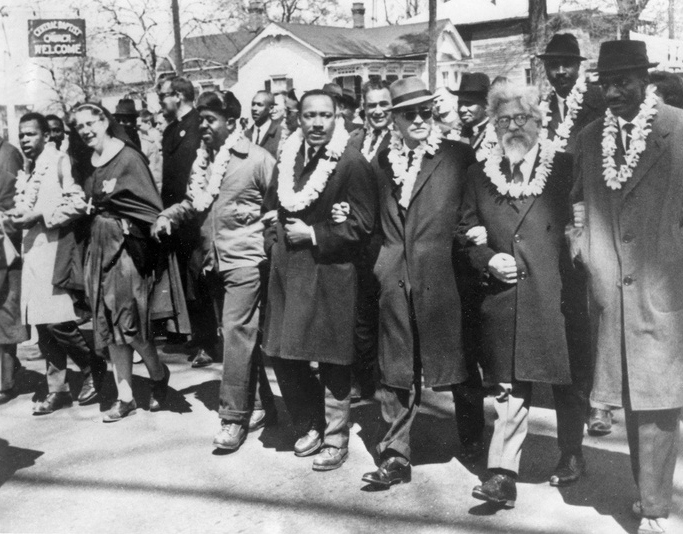 Showing a striking black and white photograph of Martin Luther King Jr. and several other marchers wearing white plumeria lei, the article explains the so-called “untold backstory of aloha” and its role in supporting the civil rights movement, which the author uses as an example of Asian American inclusion. Despite lei often being understood only as symbols of the American tourist vacation to Hawaiʻi, giving lei is a meaningful, traditional and contemporary Native Hawaiian practice that acknowledges special occasions and expresses love, gratitude, and respect. The lei of this photo were given by Rev. Abraham Akaka, and thus must be understood within a Native Hawaiian context, not a general “Asian and Pacific Islander” context. For those of us in the Muliwai this article conjured the ongoing conflation of Pacific Islanders and Asian Americans, erasing our varied political and cultural identities in one post which was later shared as “truth” across social media and news sites. We got huhū. Rolling eyes. Business as usual. Perhaps we celebrate these images and histories because Pacific Islanders (and to some extent Asian Americans) feel our presence and commitment to racial justice erased. We are so marginalized that we cling to any sliver of mainstream representation, even when we critique it within our communities. As a result, we see these articles in our news feeds, we maybe even repost or share them, and in so doing we let the historical accuracy and political implications go unquestioned. With this exception of this storify dialogue, the criticism of this article was non-existent. Many of us observed in our facebook feeds this article being shared widely by Asian American friends, even those who are well-versed in anti-colonial critiques and are culturally sensitive to the plights of Pacific Islanders. When called out, there was very little acknowledgement, and criticism quickly devolved into online debates among “friends” who clung to the invented symbolism brought forth by the author and the desire to be seen within the larger civil rights movement. It took a great deal of conversation for them to put that idea aside and focus on the erasure of Native Hawaiians in the article. We want to encourage readers to consider why we are all so desperate for recognition and inclusion in the history of civil rights, even at the expense of vacating the specific histories and political investments of other marginalized groups. In this case, Native Hawaiians. Another way to read this article and its uncritical circulation is that Pacific Islanders may see this image of Dr. King wearing lei as evidence of our small part in supporting an historic event that contributed to shifting perceptions and social change in some way. Those lei are something we should celebrate. In Oceania, we give lei for many different occasions, usually to mark the significance of the event and the person wearing it, no matter how small the celebration or encounter. It matters profoundly that Reverend Abraham Akaka, then Kahu of Kawaiahaʻo Church in Honolulu sent these lei to Selma as an example of the significance of the event and of the marchers. But, this relationship did not occur out of thin air. Reverend Akaka and Dr. King already knew each other, presumably as two preachers seeking justice and because Dr. King visited Hawaiʻi on September 17, 1959, less than a month after Hawaiʻi transformed from a territory to a “state”. Reverend Akaka is also known for giving a famous sermon following the passage of the Hawaiʻi Admission Act, proclaiming that Hawaiʻi’s gift to the world is the “spirit of aloha.” Yet Hawaiʻi statehood was largely motivated by haole and Asian settlers who aspired to middle class U.S. citizenship while Kanaka Maoli were dispossessed and silenced. Is this example of the journey to Hawaiʻi statehood really a “gift” given by Kanaka Maoli, or is it evidence of the power of capitalism? Would any of our ancestors, dispossessed of their lands, agree that illegal occupation motivated by capitalist greed is representative of aloha in any way? Two things are crucial here – 1) We would never undermine the significance of the lei in this photo, but we cannot erase the Native Hawaiian dispossession that occurred via statehood, which can be linked to events that followed, such as John F. Kennedy’s visit to the islands in 1963 when he proclaimed that Hawaiʻi had something to teach the U.S. about tolerance. Not incidentally, President Obama’s image has extended the life of this idea of Hawaiʻi as a model of racial tolerance, which erases the racism and colonialism that structure all lives in Hawaiʻi. 2) We don’t want to dismiss the spiritual significance of aloha, of course, but we have to mark in some way that its constant decontextualization and depoliticization makes it always subject to misinterpretation in the advancement of a universal celebration of Hawaiian culture without accountability to Native Hawaiians. The simplistic idea that Hawaiʻi is a place of racial tolerance erases settler colonialism in Hawaiʻi, and it also creates an invented exemplary “Hawaiian paradise” and “peaceful, loving Hawaiians” as a tool with which to discipline other subjects who speak out against racial injustice (as if everyone should be nice like the feminized ideal of Hawaiians). This conflation of colonialism/capitalism/empire with a feminized spirit of aloha and tranquility, and the allegations that Dr. King wanted “the same” for the U.S. South, perpetuates the mis-remembering of Dr. King as an “acceptable” benevolent, nonviolent national figure and not someone who was also increasingly speaking out against American imperialism (Vietnam War). The popular circulation of the photo of Dr. King wearing a lei, and the broader “celebration” of the 50th anniversary of Bloody Sunday also obscures issues of voting rights today. This is not to demean the actual courage and revolutionary power of those who marched across the Edmund Pettus bridge and were brutally beaten for demanding the end of discriminatory voting practices. Yet it seems curiously tone deaf to see President Obama celebrate the anniversary of Selma as a turning point in the history of full enfranchisement when the Voting Rights Act was effectively gutted in 2013, after the Supreme Court struck down provisions that had required states to obtain federal approval before making changes to election laws. This Supreme Court decision has allowed the rise of voter id laws and other voting restrictions in the South, which adversely impacts Black communities and other communities of color. This stark truth should remind us to remember Bloody Sunday not as a settled achievement that shows the U.S. is always making progress, but as a call to action to fight the daily injustices, mass incarceration and death that Black people face in the U.S. This is the ongoing work that the Black Lives Matter movement calls all of us to do. Many in our Pacific Islander communities have participated in Black Lives Matter actions around the country, and we hope this commitment will be ongoing. Another popular link circulating on social media after the 50th anniversary of Bloody Sunday was a segment about the lack of voting rights in U.S. territories on John Oliver’s HBO show Last Week Tonight. While this clip is also enjoyable because it recognizes often overlooked existence of U.S. territories including Puerto Rico, the U.S. Virgin Islands, Guam, the Marianas, and American Samoa (and even shows Chamorro scholar Dr. Anne Perez Hattori explaining the explicitly racist history of the Insular cases), it assumes that all of these territories face injustice in the same ways and that the key problem they face is the inability to vote for U.S. President. The segment’s insistence on the American-ness of Guam and American Samoa in particular erases the Indigenous context of these Pacific nations. Though of course U.S. territories should be afforded voting rights in the nation of their colonizer, voting rights is hardly an adequate solution towards resolving ongoing colonialism in these locations. In some cases, such as in American Samoa, the bestowal of full U.S. citizenship would also likely mean the destruction of the local structure of land rights, in which only people of Samoan ancestry can own land. Thus, this would likely further facilitate the dispossession of Samoans from land. In these cases, it is clear that further inclusionary measures on the part of the U.S. state is not always a clear “good”– often it likely further entrenches U.S. colonialism. Further, the invisibility of Native Hawaiians in the mainstream’s telling of the lei locates Native Hawaiians and the Pacific in the archaic past. Concomitantly, this is a colonial methodology that also invisibilizes us. The theme of the “disappearing Pacific” and its recurrence and pivotal role in the recent retelling of the Hawaiian lei in Selma narrative is very telling of contemporaneous colonial trajectories and the current political location of Native Hawaiians and Pacific communities within the geopolitical landscape. The on-going colonial discourse of the “disappearing Pacific” undergirds the vast dominance of the colonial project in the Pacific and its centrality in shaping contemporary Pacific Islander communities. Although the role of this colonial theme is meant to erase, it can also be used as a political strategy to make visible the multiple human rights violations, social justice violations and histories of genocide that currently mark the lives and experiences of Native Hawaiians and Pacific Islanders. For example, one of the most important issues that we are currently fighting in the Pacific are rising sea levels, climate change, or the “disappearance” of our island homelands, peoples and cultures as a consequence of First World greed and colonialisms such as over fishing, mining and clear cutting of our forests. One of the most profound war-cry that resonates in the voices of climate change activists in the Pacific and is shared with activists here in the U.S. states, “We are not drowning, we are fighting.” Hence, as this slogan states and makes visible, for us Native Hawaiians and Pacific Islanders, our resistances against colonialisms, is our collective resistance to our erasure or our systemic “drowning”. It is also our collective resistance against our erasure or our “drowning” as Native Hawaiians and Pacific Islanders that motivates us as a collective of Pacific Islander scholars and activists to come together and to write this collective article as a means of speaking-back against the hegemonic retelling of the Hawaiian lei narrative and its invisibilization of Hawaiʻi; As Native Hawaiian and Pacific Islander scholars and activists, we, too, refuse the colonial project and its goal to make us “disappear”. As a collective, “We are fighting”. The colonial theme of “the disappearing Pacific” also shapes the racial classification of Native Hawaiians and Pacific Islanders under the API rubric here in the U.S. Within this colonial and racist classification, Pacific islanders are made to “disappear” through processes of being subsumed under the discourse of Asian. The API racial classification erases the histories of struggle, resistance and the hard work of Native Hawaiian and Pacific Islanders to successfully disaggregate Native Hawaiians and Pacific Islanders from the API classification in the U.S. Census. API is a racial classification that not only erases Pacific Islanders, but more importantly, it subsequently erases the vibrant and contemporaneous histories of Native Hawaiian and Pacific Islander resistance and struggles for self-determination here in the U.S. Moreover, API erases the Indigenous genealogy that roots Native Hawaiian and Pacific Islanders and this erasure undermines our profound sacred and political connections to our Indigenous relatives here in the U.S. The “disappearing Pacific” discourse plays an important role in justifying past and present colonialisms and it allays the wounds caused by settler colonialisms. Locating Pacific lands, oceans and peoples as “invisible” is to render them subjugated and this justifies the stripping of Indigenous lands, culture, ocean and peoples to make way for colonial expansion. In short, we encourage everyone to read the photo of Dr. King and the other marchers wearing lei in Selma against the grain. We hope photos like this can become a symbol of commitment to dismantling white supremacy, settler colonialism and Orientalism/imperialism, because these are mutually reinforcing structures, as Dr. King, Mohammed Ali, Malcolm X, Yuri Kochiyama, Haunani-Kay Trask and many other revolutionary organizers and leaders have noted. Read the photo as marking an ongoing, not fully fulfilled commitment to different but intertwined struggles, not a celebration of U.S. progress and tolerance. Do not allow Native Hawaiians and other Pacific Islanders to fall out of who you imagine to be fighting for radical, transformative justice. This entry was tagged #muliwai, #rethinkAPIA, Native Hawaiians, Pacific Islanders. Bookmark the permalink. Please take a moment to read a post I’ve collectively written with fellow Pacific Islander scholars. This post speaks back to the widely circulated article celebrating the 50th anniversary of the Selma march, incorrectly claiming the lei worn by MLK as a symbol of Asian American solidarity. Natalee, thank you for writing this. I agree with the critiques and the conclusion and will share this as widely as a I can. Thank you, Keith! I appreciate your support. I am in the grip of work and have not been able to settle my mind enough to write this past week. I think this is an important article and so am reblogging it. Mahalo nui for sharing this! I felt very weird when I saw that article circulating, especially since it was posted by many Asian American (vs local Asian) friends who don’t have as much of an understanding of the differences between “Asian” and “Pacific Islander”. Your article stirred up some thoughts with an Asian American colleague in my organization, so we are hoping for some positive change in the language we use and the ways we engage in works of justice and advocacy around ethnicity, culture, and decolonization/deoccupation. Thanks again! This was a fantastic article!